This half of the article deals with all the finishing chores needed to complete your track. Don’t try to hurry things up during this stage; just be patient & do a good job. You will be rewarded with a nice track that will give you many years of enjoyment. 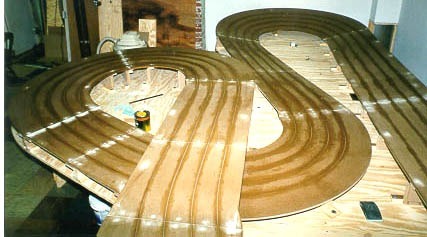 Once all the serious woodwork is complete, the next step is finishing the track surface. Before any paint goes on, all screw holes & section joints must be filled & sanded smooth. We used ordinary drywall joint compound for this step. It’s cheap, there’s no mixing, & it sands easily, but frankly, we wish we would have used something else, like auto body filler (Bondo) or wood filler. The joint compound “pops up” slightly after a few weeks & shows every screw. Whatever you use, apply with a putty knife, sand using 100 or 120 grit paper on a sanding block, & reapply as necessary. We chose Minwax satin polyurethane varnish as a “primer”. This readily soaks into the MDF & when hard, gives a smooth, tough “skin” that should resist wear well (in the slots) & make a good base for the paint everywhere else. Jeff (who was in charge of all the “bodywork”) applied the varnish fairly wet with a 2” disposable brush to the slot and copper tape area only. 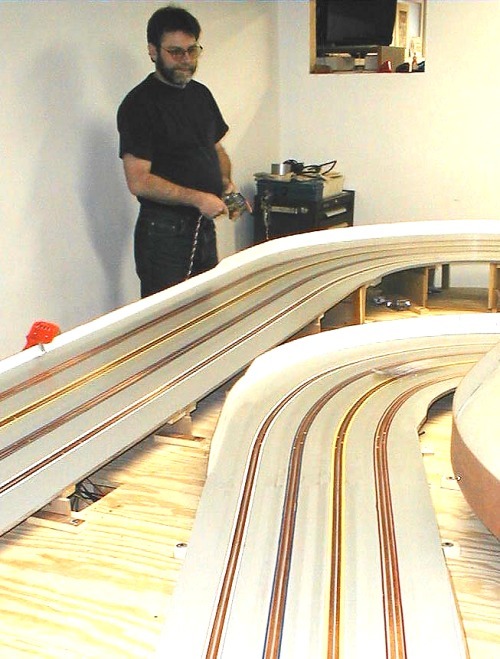 After it was allowed to dry overnight, he lightly sanded it & applied the varnish to the rest of the track surface. Be sure to thoroughly vacuum & tack off the surface before each application. This will reduce the sanding work that follows, using 120 paper on a block. Change the paper often to avoid loading up. Fold some sandpaper once or twice & sand the slots lightly, too. 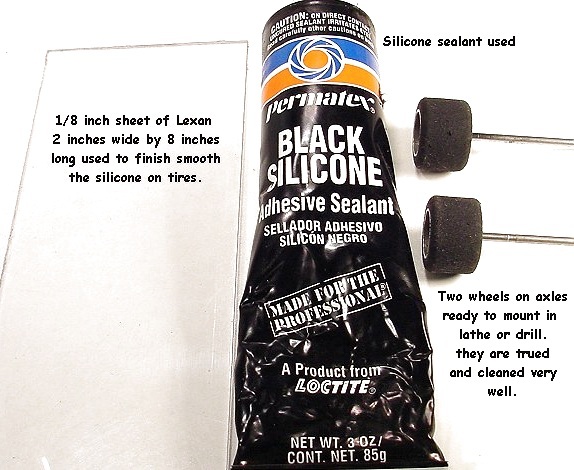 There are three different paints we considered: enamel, urethane, & epoxy. We settled on the epoxy. Ours is made by Valspar for garage floors, is available in two shades of gray & a few colors, & comes in 2 one-gallon cans that are half full. When mixed 50/50, a full gallon is obtained. We bought it at Lowe’s home-improvement store for about $32. This stuff contains toluene & is NOT water-based, so plenty of ventilation is required. When fully cured, it will shed bullets (well, almost). Jeff said that once this paint is mixed, there’s no going back, so don’t mix the whole gallon at the same time. Our track has an actual surface area of about 92 square feet, & we found that just over a quart was enough for a complete coat. You can use a full-size (8”) paint roller for applying this stuff. Buy those that are made for “smooth surfaces” & get several; you can’t reuse them. Jeff ended up putting two coats on, sanding & cleaning in between, because he wasn’t satisfied with how the first coat turned out. A fair amount of trouble was had with the application of the epoxy, The key here is to work fast, & apply as wet as possible. This will eliminate the dry, dull spots. Once again, Jeff stresses adequate ventilation, & a good quality paint mask is a must. The fumes from the epoxy paint can make you sick in ten minutes. Ask him, he knows. Next is the copper tape. We did quite a bit of searching before settling on 1.5 mil (.0015”) x 5/16” wide, by Venture (www.venturetape.com). This is primarily made for the stained-glass industry, & can be bought at a stained-glass supply store. This size is about the thickest that is readily available without a special order. Since we’re beginners at track building, we decided to keep it simple, so we chose tape rather than braid, keeping in mind the type of racing we intend to do. This is one of those jobs where the only way you can learn is by actually doing it. Wipe the area to be taped with naphtha (lighter fluid) or isopropyl (rubbing) alcohol. It should be as clean & oil-free as possible for best adhesion, so once clean, don’t touch it with your bare hands. A small wallpaper seam roller is a really good way to stick this stuff down hard, & is a must-have tool. Peel the backing off a few feet of tape, stick it in place, & roll, then repeat. Do one side of the slot all the way around, keeping the tape about 1/32” (max) away from the slot, then do the other side. Minor kinks in the curves will flatten out after rolling. The tape may tend to pop up here & there in a day or two. Reroll as needed, & they will eventually go away. Ours did, anyway. Jeff wants to mention that the tape likes to unravel when you lay the roll down while applying a section. This can result in creases & kinks in the tape before it’s even applied. Jeff stopped right there & went on strike till something was done. I made up a simple “dispenser” for the tape out of scrap pieces of MDF. It worked like a charm. 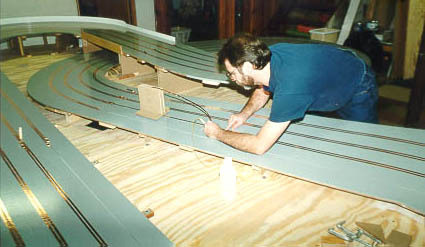 With Jeff content again, he resumed the tedious job of taping the track. 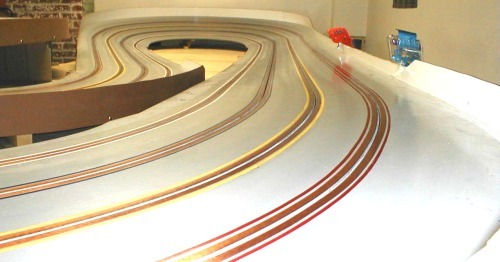 Since the rolls are 108 feet long, you may run out of tape halfway through a lane. The tape cannot be simply overlapped, since the adhesive will effectively insulate the two layers. To splice another length of tape, peel about an inch of backing off the new piece, then carefully clean off the last ¼” of adhesive from the underside of the tape with acetone & a Q-Tip. Put a little paste flux on the bare spot, & deposit just a dab of solder on it. Proceed to lay the new tape in the usual manner, overlapping the old tape by about an inch. Later, go back & heat up that spot of solder (put a little flux on it first) & press it right down with the roller before it freezes. It won’t take long to melt, because the tape is so thin, so don’t overheat it. You might want to protect the paint in the surrounding area with a couple pieces of thin cardstock taped to the track to act as a heat shield. Again, you’ll learn by doing, but it’s always a good idea to practice anything unfamiliar first on mockups of the real thing. Lay the tape right over the tap holes. These are drilled & countersunk before finishing the surface. 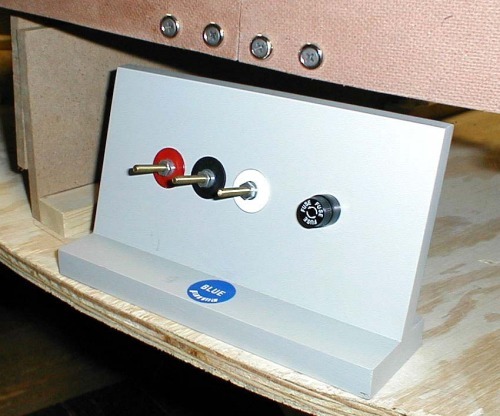 Be sure to use an 81-degree countersink (another must-have tool) to match the angle on the screw heads. The idea is to end up with the tape clamped between the countersink hole & the screw head, & if the angles don’t match, poor electrical contact could result. 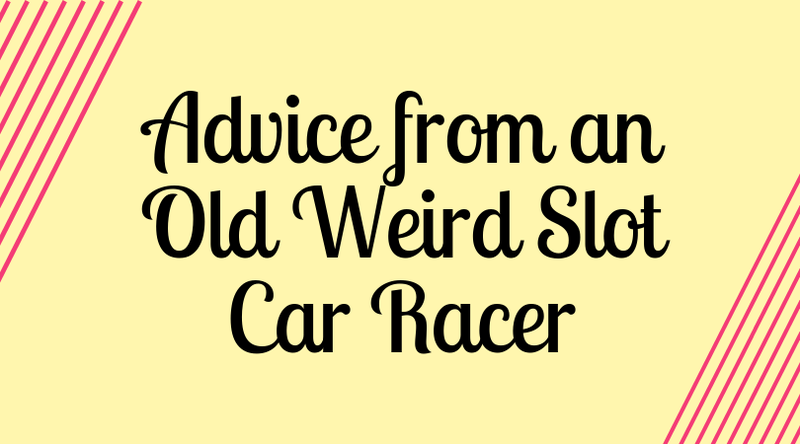 Don’t locate the holes straddling the slot side-by-side; stagger them a few inches apart. This will give your knuckles some comfortable clearance later when wiring. If you use a dead strip for the lap counter, it will need its own set of tap holes. 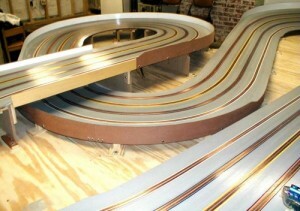 We wired the track next, leaving the lane striping & crash walls for last. 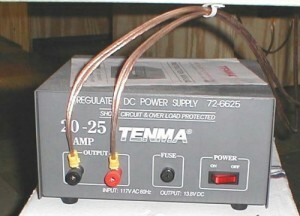 We use a 20-amp “Tenma” brand power supply bought from MCM Electronics (www.mcmelectronics.com), for about $80 (on sale). 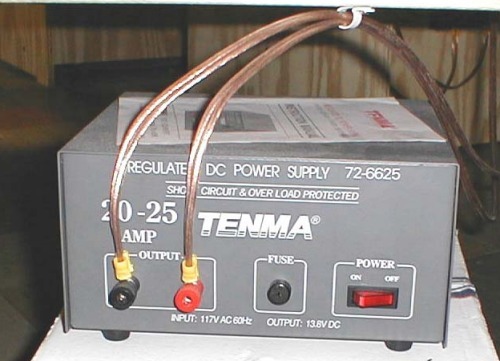 It delivers 13.8 volts & 20 amps continuously, & can surge to 25 amps. AC ripple is less than 50 millivolts, & the supply is fully regulated & protected. With the low-end motors we intend to run, this supply should be adequate; if necessary, we can wire a second power supply in parallel to boost the available current, without changing the voltage. 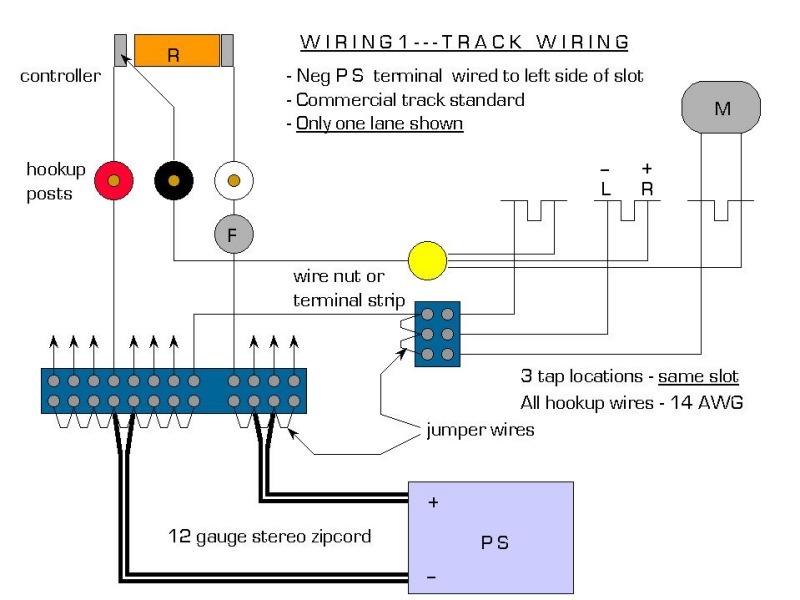 The wiring diagram pretty much tells the whole story. 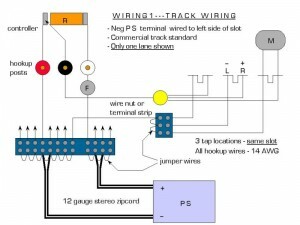 A terminal strip was attached to the table frame in a central location, & the power supply was connected to it with double 12-gauge stereo wire (zipcord). 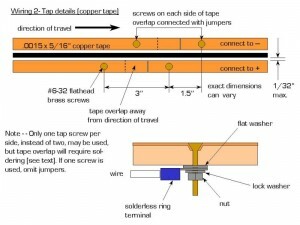 The terminal strip is divided into two separate zones, + & —, by using jumper wires. The control panels were placed where we thought they should go (consider driver visibility here), & we began wiring by installing the tap screws on the left side of the slots only, & running wires from them to the negative (—) terminal strip. This forms the supply path from the power supply to each slot. Then the tap screws were installed on the right side of all slots, & a wire was run from each slot to the corresponding control panel, connecting it to the black (wiper) controller post. Brake wires were run next, from the negative (—) terminal strip to the red posts on all panels, & finally the return wires were run from the positive (+) terminal strip to the fuse holders on each panel. A jumper connects the fuse holder to the white (resistor) post. The control panels were then screwed in place from the underside of the table. 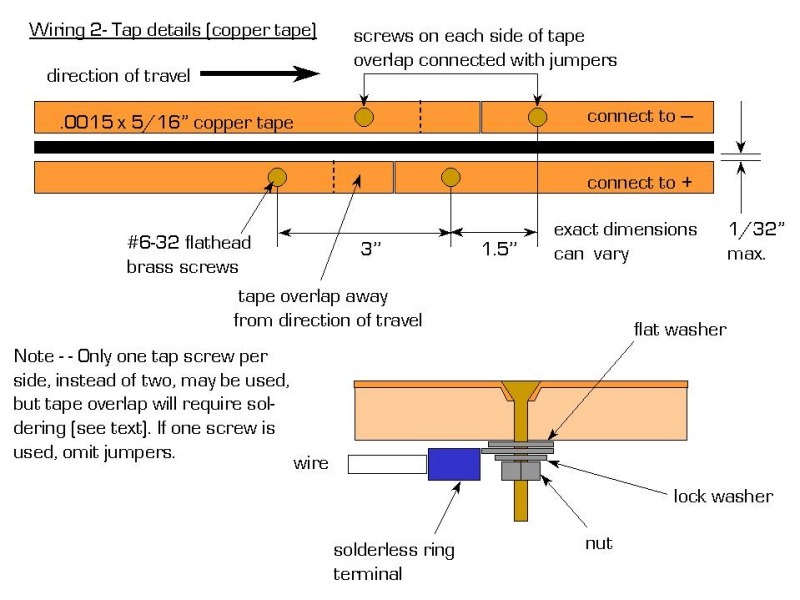 The method we used to connect the wires to the slots is as follows: The copper tape is dimpled down into the countersink with the finger, then a 1/8” hole is punched through the tape with a sharp awl or skewer in the center of the dimple. A 6-32 x 1” brass flathead machine screw is inserted & pushed down into the countersink, drawing the tape in with it. 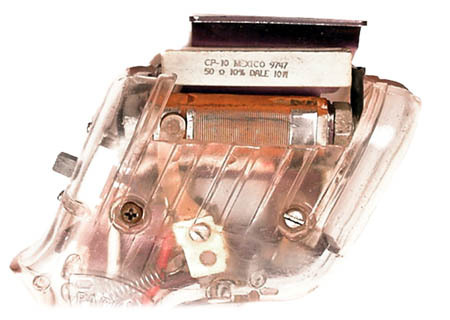 The wire to be connected is prepared by stripping the insulation & crimping on a ring-type solderless terminal. 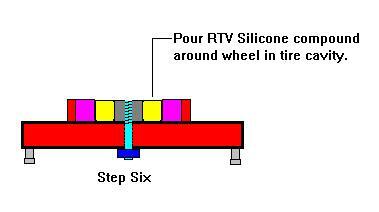 A #6 flat washer is placed on the screw from the underside, followed by the wire terminal, then a #6 lock washer, & finally a nut. 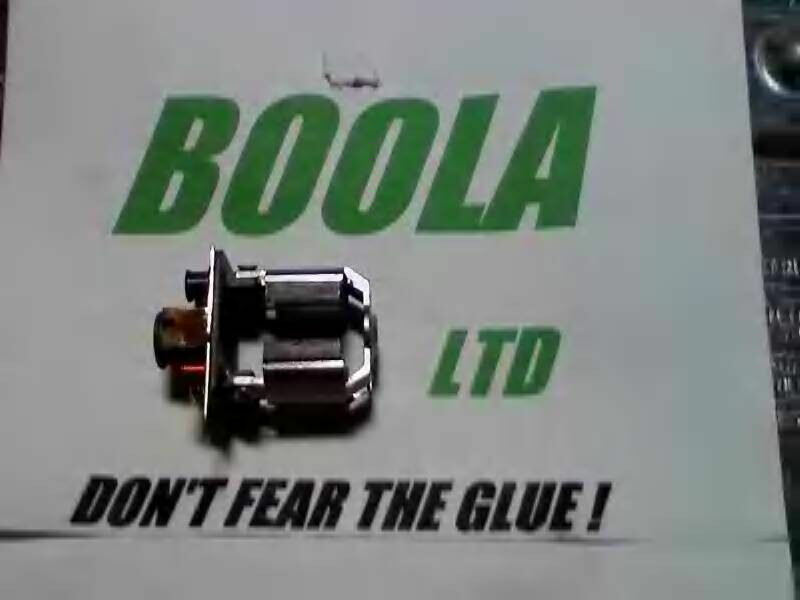 When tightening the nut, it is very important to keep the screw from turning. Twisting the screw could chew up the tape under the screw head, resulting in loss of contact. Hold the screw steady with a screwdriver & turn the nut only with a nut driver. There were places on the track that required both of us to do this job, one on top with the screwdriver, & one under the table with the wires & hardware. As mentioned, the screw should clamp the tape under its head, & in addition, the screw should end up flush or slightly below the surface when installed correctly. The screws do not have to be super-tight, just a firm feel is all that is necessary. 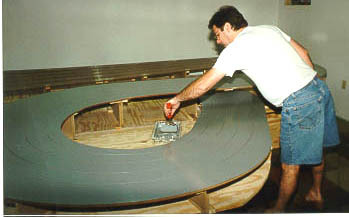 Each control panel was made up from a piece of ¾” hardwood plywood for a base, with a piece of ½” MDF glued into a dado cut at a 15-degree angle in the base. The hookup posts are 3” lengths of 10-24 brass allthread, secured with washers, lockwashers, & nuts on both sides of the panel. A panel-mount fuse holder was also installed in each unit. Wires connect to the posts with ring terminals, & to the fuse holder with QC terminals, although the fuse hookups could be soldered instead. Color identification of the posts was done by simply spray-painting some 1” diameter fender washers the appropriate colors & clamping them against the panel under the lock washers & nuts. All wire, except for the power supply leads to the terminal strip, is 14AWG. 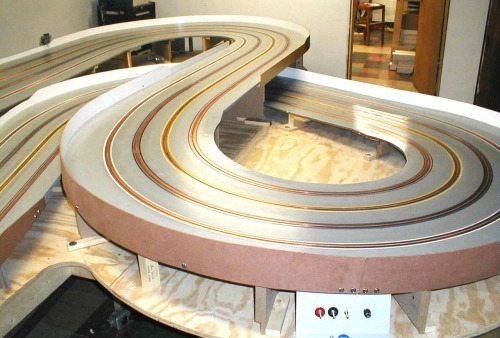 We think this is large enough for a home track, considering the short lengths of the wire runs & the relatively low-amp motors we will be running. Using wire of different colors to indicate which wire goes where is not a bad idea, but is not essential. Simply marking the wires with labels of masking tape will do as well, or you could use Scotch brand Mystik tape in various colors. The next chore was construction of the crash walls. We used 1/8” plain white Marlite, a masonite-type product with a smooth melamine finish on one side. It is typically used for bathtub surrounds & is quite inexpensive; ours was $10 for a 4×8 sheet, which was enough to do the entire track. The white finished side will face the cars, the unfinished outer side will eventually be painted. Small blocks of 1x 2 pine, 3 or 4 inches long, were glued to the underside of the roadway with contact cement, the blocks being flush with the outer edge of the roadway, & spaced about 15” apart. Strips of Marlite were cut & drilled, & attached with Liquid Nails applied to the entire edge of the roadway with a caulking gun. 1” drywall screws with #10 finish washers were inserted through the drilled holes & into the pine screw blocks. We feel the Liquid Nails is cheap insurance against the possibility of the Marlite walls warping & bowing away from the track edge, & also adds a degree of stiffness to the track & the walls. 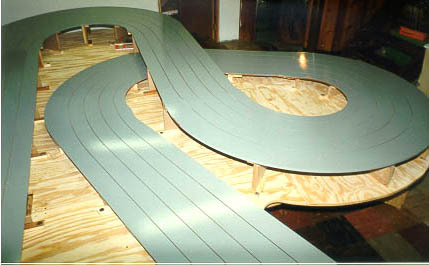 A flat track would only require straight strips of Marlite, but if there is any up-&-down geometry in the track surface, cardboard templates are necessary to transfer the proper curved shape to the crash wall material. We used ordinary poster board, found in the stationery department of a supermarket. 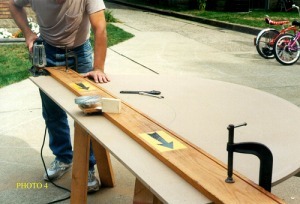 The poster board is cut into strips roughly 8” x 30”, & these are contact-cemented together end-to-end, overlapping an inch or so, until a length of about 8 feet is obtained. These long strips are then stapled to the track edge, & the road surface traced onto them with a pencil, giving a reference line. A compass is set to the desired height of the crash wall, & the road surface is again copied onto the cardboard at this height. The staples are pulled & the template laid flat on the floor. Be sure to mark which side faces “in”, & which edge is “up”. The compass is set to 1-1/4”, to allow for the roadway thickness plus the screw blocks, & the reference line is copied onto the cardboard. Cut out the template along the upper & lower compass lines with scissors (don’t cut the middle (reference) line), & trace the template onto the Marlite with a pencil. Make sure the “right” side of the template is facing up. Saw out the Marlite along the lines with a saber saw, hold in place against the track to lay out the hole locations (you need a helper for this), lay out & drill the holes, glue the edge, & screw in place. It’s a pretty slow, tedious process, but it gives great results. Other materials & methods might work as well, or better, for you than those described here; it’s just a matter of how much trouble you want to go to & how satisfied you are with the appearance & durability. As long as the crash walls keep the cars off the floor, everything else about them is optional, really. The finishing touch was the color-coding of the lanes. We bought a “Master” striping tool from Micro-Mark Tools, (www.micromark.com), with a 1/8” wide paint wheel. Jeff used Red Devil latex acrylic enamel from the local hardware, in small (8-oz) cans. Our choice of lane colors was red, yellow, blue, & white, starting with the outer lane on the main straight. There is no particular significance to these colors; they just seemed appropriate to us. However, you might want to consider the contrast of the lane colors against that of the track surface, & alternate darker & lighter colors. You have a completely free hand in this department. Jeff was impressed with the way the “Master” striping tool performed. Again, a little practice on some scrap MDF is a good idea. 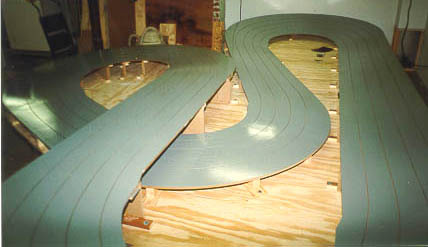 The track is now “finished”, in the sense that you can run cars on it, but to really race, a lap counter/timing system is needed. We haven’t installed ours yet, but are looking at the TrakMate system. 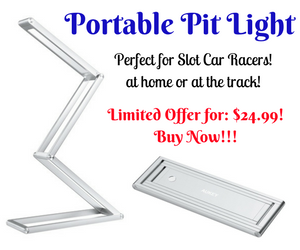 It is low-cost & has all the features needed for home racing. We will probably go with a dead strip detector rather than photocells. We really don’t care for the look of the required light bridge, & the wrong car can trip a lap even if it passes through on its roof. We have not touched on scenery in this article, since the sky’s the limit in that department. Some people prefer no scenery at all, or only a very abbreviated representation of scenery; others may prefer highly realistic terrain, trees, people, buildings & cars. 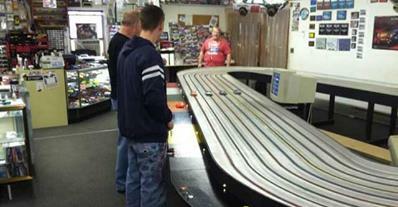 For these folks, I recommend utilizing the resources of model railroading. There are some truly amazing products & techniques used in that hobby that can be easily applied to slot car tracks. This wraps up Part 2 of how we built our track. 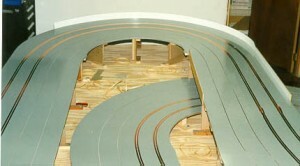 We don’t claim to be experts, nor do we claim that this is the best way, or even the only way, to build a home track. 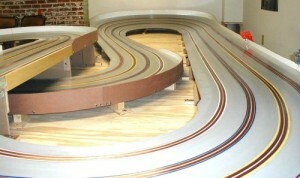 Every situation is different, & your track must be designed & built to fit your specific needs. 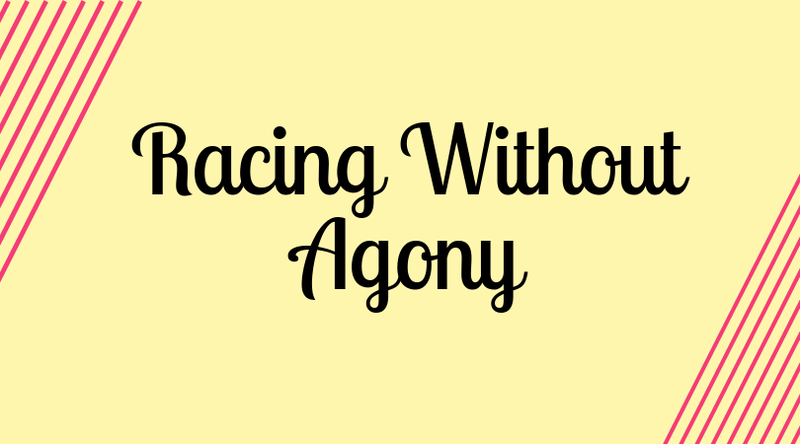 Many factors must be considered, including space, time, money, & the kind of racing you are interested in. Our goal in putting this article together was merely to share our experiences & ideas, & stimulate your imagination. 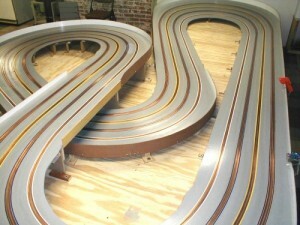 We hope to submit a “Part 3” of our track building odyssey in the coming months. 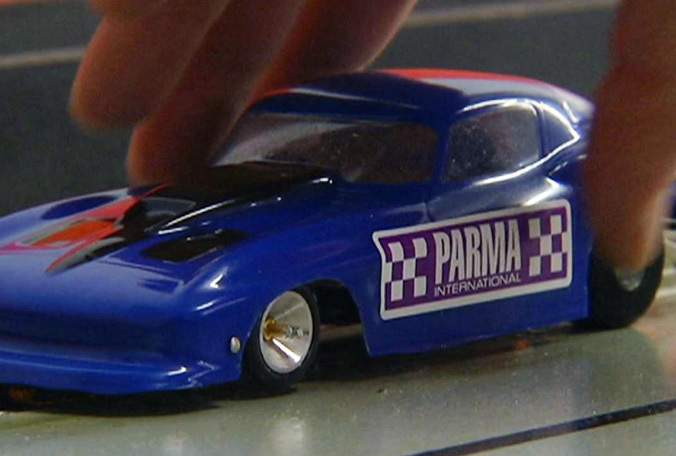 We’ll need some time to see how the power supply performs, and how the track in general is holding up. Even with the careful planning that went into this project, we won’t be too surprised if a snag or two turns up. 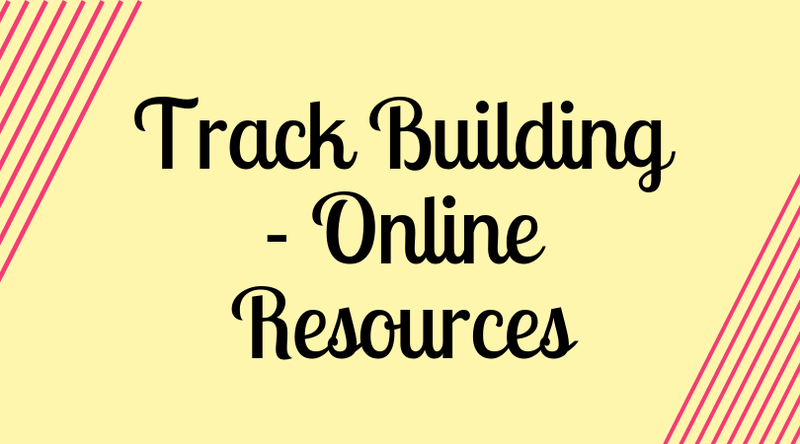 So until then, good luck on your own track building project, & don’t hesitate to contact us with questions, comments, or suggestions. A) Ready for paint. Slots have 2 coats of polyurethane. B) Jeff rolling on the first coat of epoxy paint. He later switched to a full-size roller. C) The completed paint job. What a difference! D) Another view after painting. E) Copper tape has been applied to 2 lanes. The crash walls have also started to go up. F) Almost finished taping. Note the tape dispenser – it keeps the tape from twisting & kinking. G) High overall view from the leadon. H) A view from the Blue driver’s panel. I) A view of the deadman & donut from the Yellow driver’s panel. J) Looking towards the bank from the White driver’s panel. K) A low view down the straight. L) The power supply. Note the 12-gauge stereo zipcord. N) Jeff taking a test spin on yellow. Car is in the deadman.